It has been quite long since I ditched the sad songs away from my play-list. I had had those for various reasons actually- Memories, Nice rendition, Lyrics, the visual effects and what-nots. But now, I have decided to get done with them and instead replace them with some chill fast peppy numbers. The advantages of it are manifold ( Do I sound a lil like Sheldon Cooper??). It literally jolts me awake. Either from a slumber-y kind of state or from deep periods of absent-mindedness. Whatever, It kinda energises me. It acts as a “wannabe” performance songlist ( Ha ha , I do that often. Imagining myself to be a performance artist and crooning on the stage in some Shakira-effect!! C’mon! Who doesn’t like a nice dream *wink* *wink*. It doubles up as the standby official workout playlist that helps me burn off the anxiety and negativity and makes me feel soooooo goood and relaaaaaaxed. Angrezi Beat- Yo Yo- Dude wait!! Before you curse me for having chosen to listen to Honey Singh, lemme tell ya that this song is fast enough to get us reeling in sweat. Though the words drip of arrogance and a bit of Chauvinism, well, who cares about the words. Put in on Karaoke mode and croon!! Taxi- Taxi- This Gem from A R Rahman will make us a bit relaxed ( since it is of a lesser tempo than the above two) and the beats are thumping and fab! 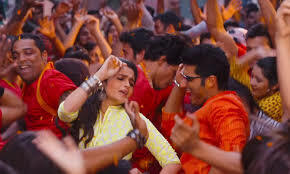 Offo- 2 States- Delightful and a cheerful song. Apt for smiley smiley dancin!! And Waka Waka- Shakira- Who could even forget her?? Definitely a Must-have in the playlist! Oh!!! Let your hair down and dance!